Scholastic Press, New York, 2009. 344 pages. I'm a huge fan of Patricia C. Wrede's books, particularly the Enchanted Forest Chronicles and Sorcery and Cecilia. So when I heard she had written a new book, I snapped it up. Everybody knows that a seventh son is lucky. Things come a little easier to him, all his life long: love and money and fine weather and the unexpected turn that brings good fortune from bad circumstances. A lot of seventh sons go for magicians, because if there's one sort of work where luck is more useful than any other, it's making magic. And everybody knows that the seventh son of a seventh son is a natural-born magician. A double-seven doesn't even need schooling to start working spells, though the magic comes on faster and safer if he gets some. When he's grown and come into his power for true and all, he can even do the Major Spells on his own, the ones that can call up a storm or quiet one, move the earth or still it, anger the ocean or calm it to glassy smoothness. People are real nice to a double-seventh son. Nobody seems to think much about all the other sons, or the daughters. There's nearly always daughters, because hardly anybody has seven sons right in a row, boom, like that. Sometimes there are so many daughters that people give up trying for seven sons. After all, there's plenty enough work in raising eleven or twelve childings, and a thirteenth child -- son or daughter -- is unlucky. So everybody says. Papa and Mama didn't pay much attention to what everybody says, I guess, because there are fourteen of us. Lan is the youngest, a double-seven, and he's half the reason we moved away from Helvan Shores when I was five. The other half of the reason was me. I'm Eff -- the seventh daughter. Lan's twin . . .
. . . and a thirteenth child. 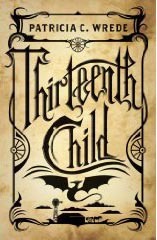 Thirteenth Child is set in an alternate reality Old West, where dangerous magical creatures are kept at bay from frontier settlements by magicians at each settlement. Eff's father is a skilled magician who goes out west to teach at a college that trains such magicians. Eff must come to terms with her own supposed bad luck, afraid of what she might do if she lets her magic loose. This book reminded me of Robin McKinley's Dragonhaven. Both are set in an alternate reality with wilderness and magical creatures. Both involve the protagonist growing up over a long passage of years. The focus in Thirteenth Child is more on building an intriguing magical world than on the plot itself. I was delighted to read about a fictional family as big as the one I grew up in, so I was a little disappointed not to get much of the chaotic flavor of such a family. (Though I think housekeeping is much much easier when you get to use spells to do the work.) Although the plot was not terribly gripping, I thoroughly enjoyed spending time in this world. I thoroughly enjoyed getting to know Eff as she explored different ways of doing magic and what it means to be a Columbian (American) magician. There is something of a climax at the end, where Eff plays an important part, but even she doesn't like the attention she gets from it. She's still an adolescent helping adult magicians, not really having come into her own yet. However, I'm encouraged that this is already described as "Book One." Patricia C. Wrede has laid a many-layered foundation for a bigger story, which I think is going to be exciting and compelling. I only hope I don't have to wait very long for Book Two!